Hey friends! Time for my Saturday morning ramble session again. I’m feeling the need again to emphasize the amazing amount of work it takes to homestead. By homestead, I mean working to become as self-sufficient as possible. Cutting your own wood to heat your home, growing and preserving your own food, working to use less energy and do things like hang dry your own clothes – it all takes a boat load of work. Since homesteading is often one of those lifestyles that people glorify, I want to help bring some of those misconceptions down to earth before people run out and join the homesteading lifestyle without understanding what they’re in for. CANNED our own raspberry jam!!! First time. Well, kind of the first time. I tried to make dandelion jelly last year and it was an utter fail. I didn’t handle the powdered pectin right so it didn’t gel up and the dandelion jam was more like a thick dandelion lemonade. Suffice to say I was a little nervous about trying again, but the two freezer bags of fruit, picked from our own back yard, were calling to me, so I tried it again. Thankfully, this time it worked!!! I will post a complete post on the canning of our jam this week. And for those of you wondering what on earth dandelion jelly is, you can find out here. I will hopefully be attempting to make some next spring again, because it is absolutely delicious! This is where “The Good” is really good. As Rich from Frugality Magazine pointed out on a comment the other day: “There is nothing better than sitting down to eat dinner in the middle of winter and realizing how much of your meal is home grown and cost you next to nothing.” The foods that we grow here on the farm truly do taste amazing, and there is tremendous gratification in knowing that you did it yourself and that you’re not 100% dependent on the local grocery stores in order to eat. There’s also something amazingly gratifying about hanging your clothes on the line instead of using the dryer. Or maybe it’s just me. The smell of line dried clothes in the fresh country air is simply addicting, similar to the smell of chocolate chip cookies baking in the oven. The quiet out here is also addicting. 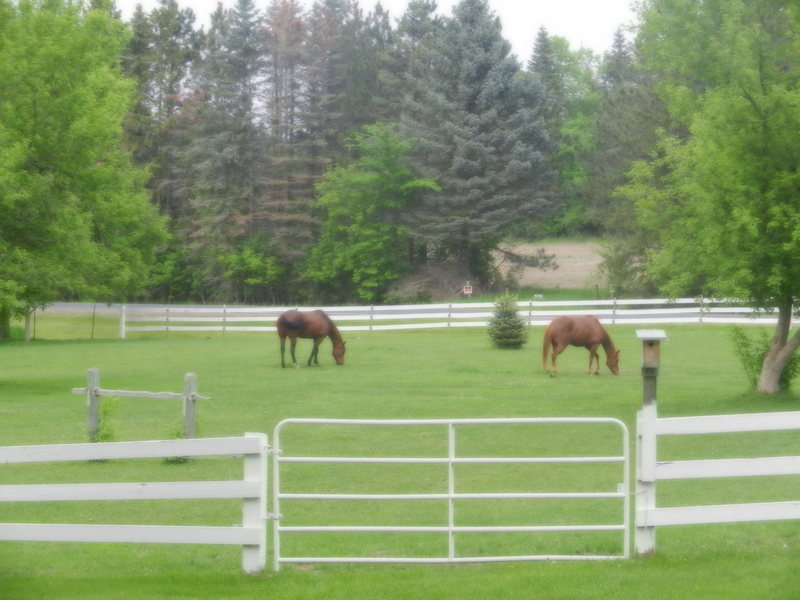 The sounds of nature: birds singing, frogs chirping, horses neighing, it’s peaceful. Amazingly peaceful. The point is that for every ounce of hard work that you put in on a homestead, there is a glorious pay off of some sort, but the gist of the payoff amounts to the fact that there is something gratifying about getting back to basics. About depending more on yourself than on others. It’s comforting to know that if some type of natural or other disaster comes in which the grocery store shelves are cleared out that we do have the know-how to grow and preserve our own food. And that if the electricity goes out or the propane runs out that we do have other options for keeping our home warm on a cold winter’s night. How self-sufficient is your household? Are you at the mercy of the local stores and the power company, or do you have other options if the grocery store/power company suddenly became off limits to you for some reason? Oh yeah, Baby! It’s Homemade Raspberry Jam! Um, not self-sufficient at all. The previous owners anted cherry and Apple trees, as well as rhubarb, grapes, and raspberries. We don’t have much time to help these poor things. We’ve got literally one cherry (it is a young tree), but we have already picked several pints of raspberries because those things just seem to put out. But that’s it. We are pretty much city slickers… If we ever move back home (the South), I’m determined to try for more self sufficiency. It’s hard this far north – the wood chopping and frantic gardening because of short seasons. I think I could handle it better in a more temperate climate. I could see how everything has an upside as well as a downside for homesteading. Especially when it comes to your meals. How cool is that to say you pretty much grew everything?! I’m completely reliant on others to provide me with everything! I’m even toying with the idea of taking an urban survival class in case something (like an earthquake around here) even happens and we are without supplies for days on end. BTW love these posts! Tonya, you should!!! There’s also really great books at the library on the subject. I heard of one called “When All Hell Breaks Loose” that is supposed to be good and geared toward city-dwellers. I can’t imagine how satisfying it is to know you produced food your family can live on. It almost sounds like homesteading is a great analogy for paying off debt. Lots of hard work, but very much worth it in the end. I’m nowhere near self-sufficient as I live in an apartment complex. We’re sadly at the mercy of mother nature and the stores. 🙂 Yeah, definitely a good analogy for paying off debt, and we are learning SO much about paying off debt through this process. As much as I sometimes miss the convenience that the city offers, I don’t miss the dependency on others that it forces. See the book I recommended above in response to Tonya’s comment….. a great book you might like. Again, thank you for writing these! I appreciate the honest perspective you give with the balance between good and bad. I agree with you that the idea of sustaining ourselves (at least in part) and not being totally reliant on the grocery store/power company is deeply appealing (and one of the reasons we want to homestead). Looking forward to the jam canning post! I’m so eager for you guys to get on your homestead. Such a valuable experience, Mrs. FW! LOL, sounds like your wife and I would get along famously! 🙂 You know, I’m not a huge jelly/jam eater, but after tasting fresh-made jam, I’m in love!!!! Thanks for the post. Just what I needed this afternoon. I have just sat down to a cuppa and said to ‘Im-in-doors – do you know I’ve done nothing today. But then I got to thinking. We went grocery shopping this morning and I had written my list using a price comparison site. I went around the store with coupons and by sorting my shop into 2 separate “shops” ended up with savings and a coupon to use next week. Came home and worked out the end of month accounts and up-dated my spreadsheets. Went out to the garden to pick rhubarb and blackberries for this evenings meal. Checked on my e-bay site and saw that I had made a sale – tiny but things are very slow there these days. Researched some vintage postcards to list so as you see – Ive done nothing today! We are almost self-sufficient as regards heating/electricity as we are solar powered. The trend here is for wood burning stoves but I think quite a few folk do not realise how much work is involved and find that buying in ready to burn wood is almost as expensive as sticking with gas or electricity. Off to do a little bit more of nothing! Thank you Laurie for sharing the good and the not so fun aspects of homesteading. I know that it take a huge amount of time and effort to be self-sufficient. I am far from where you are at this point being an apartment dweller but there are many things that us city folks can implement to become more self-reliant. There sure is, Kassandra!! There are several books on the subject, I know. Might be a blog post subject for you to think about approaching if it interests you! Laurie, I completely empathize with your desire to get away from the garden. When we were in the country, our lives were absolutely controlled by the garden and orchard. I actually grew to hate it. Do you have a root cellar? That would sure be handy for carrots, potatoes, cabbage etc. Oh, but I do long for the peace and quiet of the country. When we moved to town the thing that I had the hardest time getting accustomed to was hearing all the sirens and traffic noise. I actually have a CD that is nothing but bird sounds in the woods that I play when I need a “country sound” fix! Love this post! 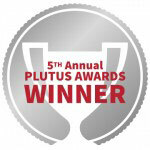 We rely entirely on grocery stores, but we would like to change that. We aren’t working on that right now, but we know for a fact that once we move into our next home that being more self-sufficient will be a large goal of ours. As someone who lost power during both the Halloween snowstorm and hurricane Sandy I know how important it is to be prepared. We made it through both storms with no wood stove or generator but we were lucky (smart) enough to grill, stock up on batteries & flashlights and water and a nearby relative with power let our son sleep over a few nights so he would be warm. Your gardening posts have brought back fond memories of my great grandmothers endless garden and making homemade jam with my other grandmother. We live in an urban/suburban area but we have a small yard and I think I might start a container garden and grow peppers, cucumbers and strawberries next year. I don’t think we are the homesteading type and wouldn’t be successful since we both work 10 hour days outside the home, but your posts are certainly inspiring! We are not self-sufficient at all. The one way we are is that my husband is a great DIYer. Oh, and I grow some veggies and herbs. But we typically eat everything as soon as it’s harvested, rather than preserving it. Knowing good DIY skills is a great step toward self-sufficiency, Amy! If one is willing, like your hubby, to dive into DIY, that is half the battle for learning to be self-sufficient in any aspect. Great post, Laurie. We are not as self-sufficient as I would like. But we are getting started. We are enjoying our vegetable garden. I truly enjoy it. We have a generator we bought on sale. We have a small stockpile for emergencies. My next goal, after the wedding, is to invest my time on research and learning to preserve food. Thank you you are always so inspirational and motivational. You guys are really coming along, Brit!! 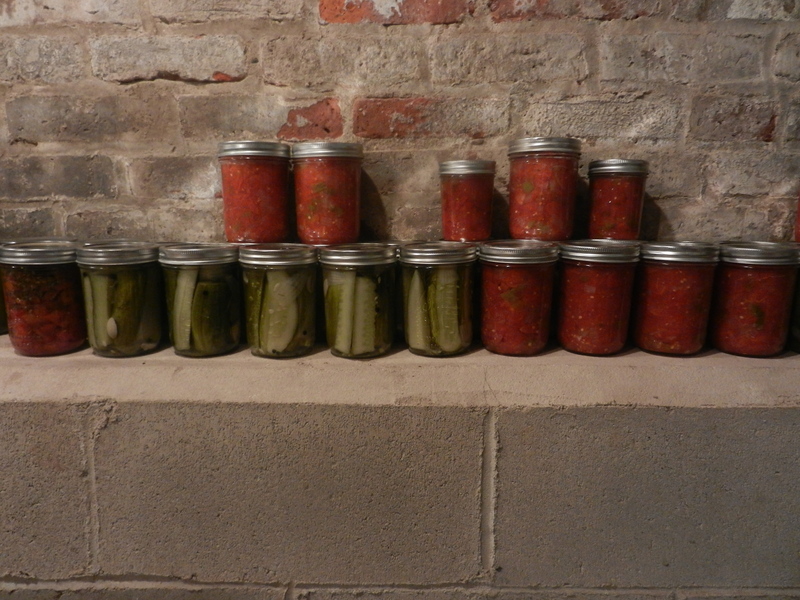 As an FYI, I have another article on food preservation coming out this week. Homemade jam! We live on five acres in Tasmania, Australia. The calf went through the fence into the neighbours place last week. Not a good move because we put him in their yards and took him to the butcher yesterday. This will give us all our meat for one year for ourselves and our adult son who lives in a pickers hut on our place. It was formerly a hops and raspberry farm and before everyone had a car, the pickers used to come and stay on the farms for several weeks at a time. We still grow wonderful raspberries and there is nothing quite like homemade jame. Loganberries, silvanberries and boysenberries are great too. We are getting older and have allowed ourselves the luxury of getting our wood delivered this year . Smart move on getting your wood delivered this year! Sounds like you have a beautiful place there, Lynda!! I’d love to hear more about it sometime. We are definitely not as self-sufficient as we would like to be, but we are making progress. As we picked our first veggies from the garden, we realized our trips to the grocery store will be slowly declining. But it’s still a long way from having enough to survive us the winter. It’s really great reading about the pros and cons of trying to do everything yourselves! We are not nearly as self-sufficient as you guys are, but we do have our first garden this year! I would love some homemade raspberry jam. Jealous! I’m so inspired by your story, Laurie. It’s so interesting. I’m in awe of how much you’ve done and how much you continue to do. I know I’ll try to start my own garden and maybe have chickens in the future, but right now, living in the city – there is just no way. But I love reading about what you’re doing re homesteading. Keep it up! It would definitely be a bit more difficult in the city. I would love to have chickens one day, but can’t reconcile to myself the whole slaughtering thing. Chickens are so cute and such great pets! We’re mildly self-sufficient. And by that I mean we would be able to survive for a few days in an apocolypse. We have 3 gardens, and plenty of vegetables and fruits from them, but other than that, not much else. We use fans when we can instead of the AC, bundle up in the winter instead of turning on the heat, and using a line to dry the clothes during the summer. Hopefully one day we’ll be killing it as well as you guys are! LOL, well, we’re working on getting it down. 🙂 Sometimes I feel like we’re complete newbies in this area. Sounds like you guys have a great start, though, and so glad to hear you’re working on doing more! I really like this post and I believe that becoming more self-sufficient is something that everyone should do — at least to some extent. Homesteading sounds like lots of work…but I’m sure it’s very satisfying to know that you’re close to self sufficient: providing your own heat, food, etc. That must be a pretty cool feeling. 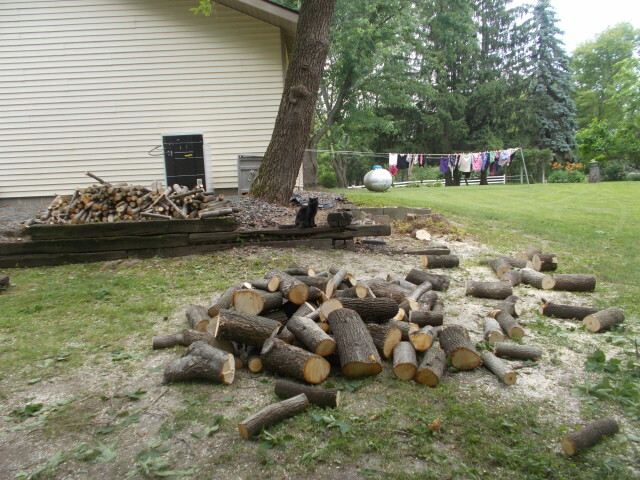 Just read your post about chopping wood…wow…that’s hard work, you guys are awesome! It’s funny that you mention hanging clothes in the clothes line because my mom mentioned that to me the other day. My mom grew up in the country. She was saying that my sister could hang a clothes line in her yard but I said you can only do that in the country where the air is fresh. Here we would get too much pollution and the clothes would smell terrible. You know, Raquel, I believe you’re right! The kids noticed a difference in the smell in the air when we moved out here!! I never noticed it, but the kids did. I know you what you mean about hard work. I’m not very self-sufficient anymore, but I did alot of these same tasks on the farm I grew up on for years! I am hoping to put in my own garden to help with my self-sufficiency this next year. I already get meat from the animals we butcher on the farm rather than the grocery store, so that’s a good start (except chicken, we don’t raise chickens). Ugh, every one of these posts makes me want to quit my job and move back to the country! Maybe I will! I can appreciate it is a lot of work but I’m glad you also appreciate the benefits. I’m not sure I could do it, Laurie, and as a result I admire you a lot!